Wearable technology is the latest trend taking over the world, and one product you will likely be hearing a lot about is the Glowbelt. The Glowbelt is a compact LED belt that can be worn around your waist or attached to your backpack, bicycle, motorcycle, even inside your pockets. It has a LED-illuminated glow that is visible up to 200 meters away, and in dark areas as well. Should you consider purchasing a Glowbelt? Well, if your lifestyle involves a lot of motorcycle-riding or biking in the early morning or the wee hours of the night, a Glowbelt will definitely be useful to you. It will help you avoid the fatal accidents listed and discussed in this page. When you are wearing a Glowbelt, you are more visible to other motorists on the road; a much-needed safety precaution for bikers. While your motorcycle or bicycle should have working headlights, taillights, reflectors, and other features to make you as easy to see in the dark as possible, having a LED-illuminated glow device on your body, along with the usual safety equipment featured in this article, is also invaluable. If you go for bike rides around the neighborhood with your family, you would want to have a Glowbelt worn by each family member especially for early evening rides. This keeps everyone safer and also makes your family more visible to motorists so they can stop to let you cross or steer clear. The Glowbelt is great not only for biking at night, but also for jogging, running or other outdoor activities. For campers who enjoy the wilderness, a Glowbelt is an excellent safety precaution especially if you are traveling with a group. In case you are separated from each other, finding your way back to your group will be easier. You would also want to have a Glowbelt on you in the unfortunate scenario of an accident that requires you to be rescued in the middle of the night. The illumination of the belt will make you easier to search out even in the dark. The Glowbelt is compact and retractable, meaning it is very convenient to pack with your belongings or even fit in your coat or pants pocket. For travelers who do not like bringing along too much stuff or too heavy items, this LED wearable belt is perfect as a handy accessory that does not take up too much storage space. For voracious readers, you can also use the Glowbelt as a mood or reading light, especially while on the road or on a plane. It is definitely more convenient to bring along with you rather than a small desk light or lamp. A Glowbelt will also come in handy during a power outage. For instance, during inclement weather, you would want to keep a Glowbelt handy in case the power goes out and you have to find your way around the house. Of course, when you travel or go camping in your favorite destinations, you should have other safety essentials with you. But a Glowbelt will give you an added sense of security knowing that you will be easier to find in case of any emergencies. 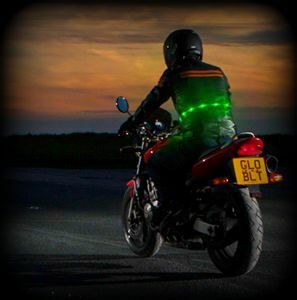 For motorcyclists, the Glowbelt not only helps you but also other motorists on the road, the same goes for bikers and joggers. A Glowbelt is also a travel essential that you should always have with you, it is as important as always having your Tires Plus credit card in your wallet. Already have a Glowbelt but doesn’t have the card yet? Well, wait no longer, get your Tires Plus credit card here.